Allspice was encountered by Christopher Columbus on the island of Jamaica during his second voyage to the New World. It was introduced into European and Mediterranean cuisines in the 16th century and it continues to be grown primarily in Jamaica. Allspice, also known as Jamaica pepper, English spice, clove pepper or Myrtle pepper, is the dried unripe berry of the pimento tree. Its unique flavors are guaranteed to add many layers of comfort and depth to both your sweet and savory cooking. 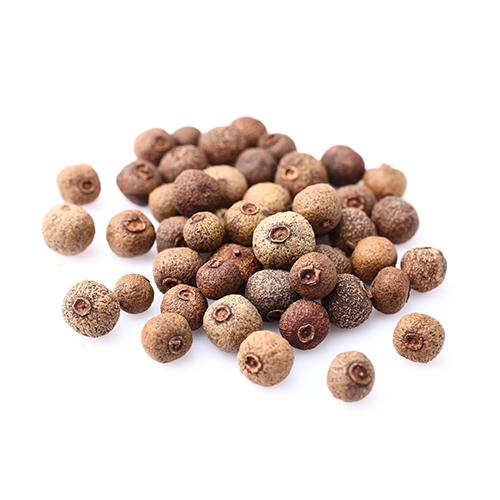 Allspice is available in whole berry form or as a ground powder that resemble dark brown peppercorns. Allspice smells and tastes like a mixture of cinnamon, cloves, and nutmeg. Gradually, allspice spread throughout the world because of its unique flavor as well as its healthy qualities. Allspice can be ground up into spice for culinary use, or the essential oil can be extracted. Whether allspice is a familiar friend or new to you, add some to your spice p ortfolio and enjoy. Pimento tree sowing is between early September and November, the first leaves appear in January. The flowers produce a succulent berry that ripens from green to dark purple and contains two pea-sized seeds. The allspice seeds are the dried, unripe, but full-grown aromatic fruits which are harvested 3-4 months after flowering. The fruits start growing after the third or fourth year in June and are harvested in September and October.